Only a few more weeks until Spring!!!!!!!!!!!! And yes I’m counting. The more sunny, warm days we get, the more the hubby and I are realizing that it’s time for us to be more active and shed the holiday pounds. The only teensy, tiny issue is that I hate exercising… Oh, and I don’t diet either. The only way I’m going to be more active is to go for more walks and on longer hikes during our adventures. Pushing a nearly 50 pound kid in a stroller up hills and over tree roots is a killer leg workout by the way. With our new found motivation, we decided that even though it was barely above freezing, we decided we were going to get out and hike the pondside trail at Killens Pond State park knowing that it was over 2 miles and not very stroller friendly. On top of that, we decided to take the dog because he needs the exercise too. That means we were outnumbered. 2 kids+ 1 dog= stressful. But it was SOOO worth it. Gibson was in his glory and D exclaimed “this is the best day ever!” during our walk while O napped on Daddy. We were the only car in the parking lot, which seems to be a trend for our Winter adventures. We let D decide if we were going to go left or right on the trail and he chose left, so we headed towards the nature center. To our surprise, it was open early so we popped in for a quick visit with the reptiles. It’s a very nice, modern building. They even recycle rainwater from the roof to use for their sanitation system. Walks with a preschooler tend to take approximately 10 times longer than they “should” take because they involve 154 stops along the way. Checking out a tree stump. Picking up rocks. Racing the dog. Feeling moss. Throwing collected items in to the water. In and out of the stroller every 20 feet. But that’s what these experiences are all about, you just have to build extra time in to your expected visit length. It took us about 2 1/2 hours to get all the way around the pond, including a stop at the playground. Speaking of moss… you know I like to let you in on my little secrets all the time, so here’s another one. I LOVE MOSS. During my time as a gardener at Mt. Cuba Center, I actually gardened the moss on the trails. We would spend our day sitting in a huge patch of moss, picking out weeds and using little brooms to sweep off debris. It was very relaxing. Since I spent so much time caring for mosses, I gained an appreciation for the fine details; their various textures and shades of green and I hope that after this post, you may be able to appreciate those things as well. 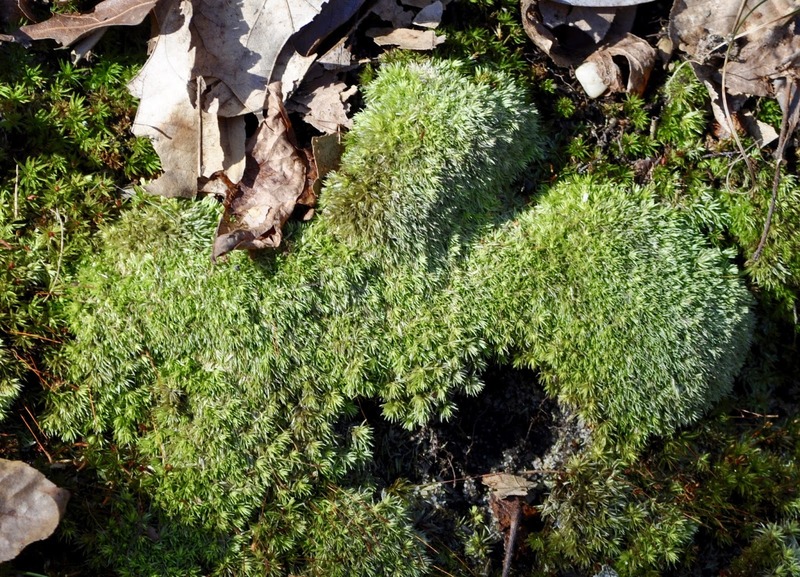 Moss is a bryophyte, which by simple definition, is a plant without vascular tissue. That means that they photosynthesize (turn carbon dioxide into sugars), but do not have roots to bring water and nutrients to their leaves. They absorb the water they need through the surface of the leaf. That’s why they are typically found in moist, sometimes shaded areas. The other major difference is that they do not produce flowers and seeds. They reproduce by way of spores, like ferns and fungi. Sporulating moss, check out the long reddish things with the cups on the tip!